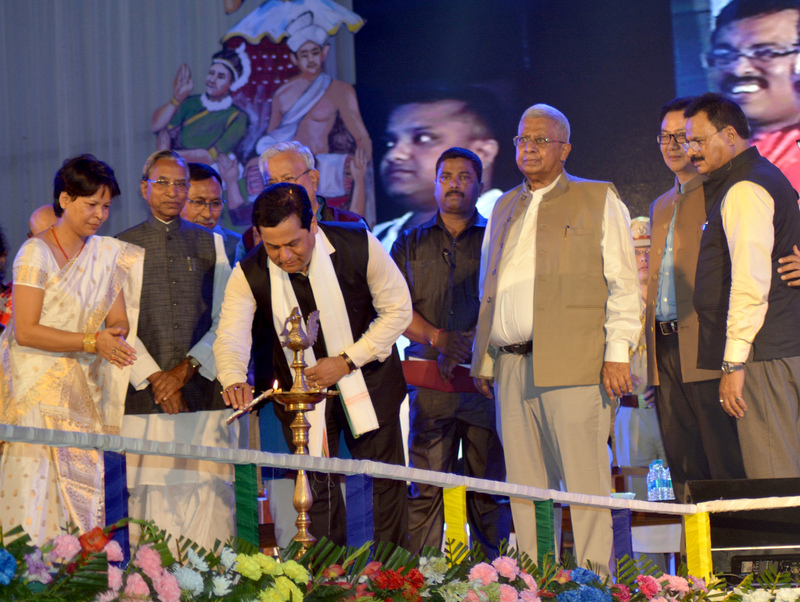 Chief Minister Sarbananda Sonowal along with others dignitaries lighting the inaugural lamp at Silchar on Saturday. Assam Chief Minister Sarbananda Sonowal on Saturday said that Barak and Brahmaputra rivers have the same language and that language is of brotherhood, unity and harmony. Speaking at the central programme of Namami Barak festival at Silchar, Sonowal said that Namami Barak is not only a festival but a new journey to explore these parts of Assam. The Chief Minister further said that Barak valley has been neglected for long and its people have lots of anguish and disappointments. Urging the people to strive for building a society based on equality and harmony as envisioned by Swami Vivekananda, Sonowal said that Dr Bhupen Hazarika and Hemanga Biswas through their creations always tried to keep the bond of unity and harmony among the people strong. The Chief Minister also said that the Central government under the leadership of Prime Minister Narendra Modi is paying lot of importance to develop Barak valley along with other parts of the Northeast. The Railway ministry has introduced many new trains from Barak valley and on Saturday too a new train connecting Silchar–Dibrugarh–Trivandrum has been flagged off, he stated. Construction of the mini-Secretariat at Silchar would start soon and Vivekananda Cultural and Research Institute is also going to be set up here, he said. A national level library would be built at Silchar and a skill development centre would also be set up at Silchar along with two other districts of Barak valley, he informed. Earlier today, Chief Minister Sonowal inaugurated Namami Barak festival at Karimganj. During his inaugural speech, the CM announced construction of 3 new bridges over Barak river to improve road communication in the valley. He also announced that a helipad will be constructed in Karimganj and the Sutarkandi International Trade Centre will be revived for growth of trade and commerce. After Karimganj, Sonowal inaugurated the Namami Barak festival at Hailakandi.